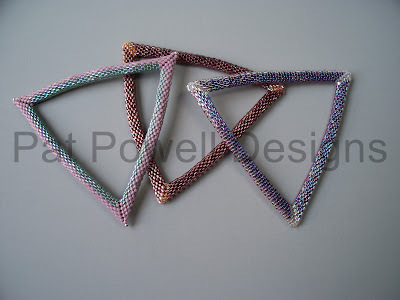 Decided it was time to go back to my shaped beadwork book (Diane Fitzgerald’s Shaped Beadwork) and tackle my next bangle shape. 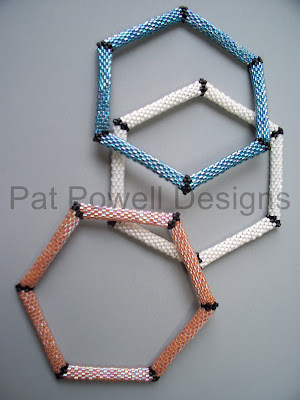 I love the hexagons and discovered they were a little easier to make than the triangles. Think the shorter sides made the difference. Still love my triangles, though. And still loving those size 10 Delicas. Think maybe my next shape might be the square or maybe the pentagon or maybe both!! Also want to try some of the shapes in size 8 Delicas. We’ll see what happens first. Simple and Elegant, love both shapes and can’t wait to see the square and pentagon worked up.